7 Ate 9: The Untold Story, written by Tara Lazar and illustrated by Ross MacDonald, is a clever mystery and a great book to read aloud in your classroom. 2) This book is positively FILLED with puns and plays on words. How many other puns and plays on words can you find in this book? Check the illustrations too! Make a list as a class. 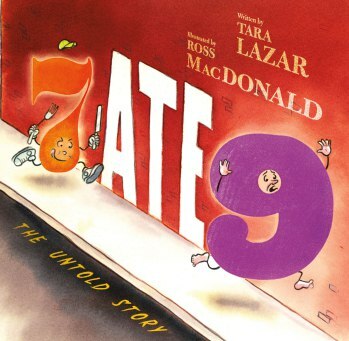 3) 7 Ate 9 is a mystery story. Try writing your own mystery story. Before you start writing, organize your thoughts. How does the mystery begin? Is there a missing person or item? Who will solve the mystery in your story? What clues can you sprinkle into your story so that the mystery can be solved? 4) Ross MacDonald managed to draw numbers in a way that gives each one lots of personality. You try! Draw a number and give it hands, feet, and a face, like in the book. You can add clothes or any other touches you like. Now write a few sentences describing the personality of your number. What foods and activities does your number like? Dislike? Who are your number’s friends? Does your number have a pet? 5) Write your own ending to 7 Ate 9. Instead of 9 turning out to be 6, and 6 trying to frame 7…what else could happen? You decide! Think of a different solution to the mystery and write it down.